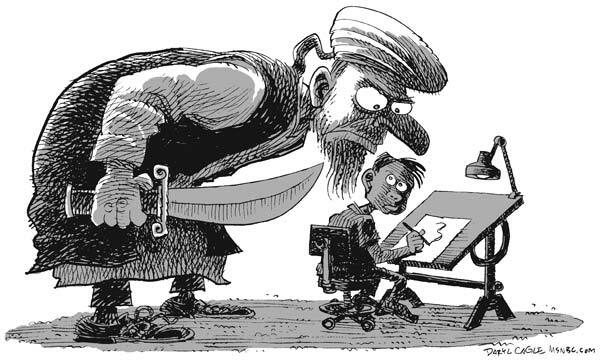 This cartoon is fundamentally RADICAL! | the rut. Great to see some new cartoons Phil. If you’re ever interested, i’d love you to drop a look in at my comic called ‘Chalk’. http://www.chalkcomic.blogspot.com. I think I might also try to get a suicide bomber cartoon up within the next two weeks. PS. I’m impatiently awaiting your next effort. This is SO wrong, that it is amazing fantastic. Thank you for the morning LOL, literally. Hi, what do I do when I want to use one of the cartoons featured on this website in a publication? I’m a psychology researcher and I would like to use the cartoon in one of my scientific publications. Any tips on how to reach the artist/publisher are welcome! Red de Blogs Ateos » ¡Eres la bomba! Boosh! too sweet. Your work is great. « This cartoon just got back from the colony. Well, most of it did, anyway.